With over 2000 shrines and temples, not to mention fire ramen, bamboo forests and street markets, the ancient capital has a lot to see over a weekend—and we have the perfect 2-day Kyoto weekend itinerary to make it happen. 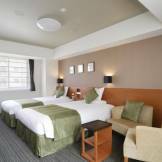 With so much to choose from, Kyoto can be a bit of an overwhelming task when it comes to planning. Although just wandering about is fine, with great distances between famous spots and early closing times, it means you can miss out on some of the best bits. Luckily, we have a tried and tested itinerary that packs all the top sights into two days—perfect if you’re on a tight schedule (one of the downsides of the JR pass) and want to see it all. If you have a little longer, stretch it out, take your time and add a few extra spots—it works for everyone. Here’s some transport info for getting there and on getting back to Tokyo too! This schedule is pretty packed, and by the end of it you will have a step count worth showing off for sure, as a lot of Kyoto is best seen on foot. The sheer quantity of locations visited have lead to my friends nicknaming it Temple Run though, so be prepared. 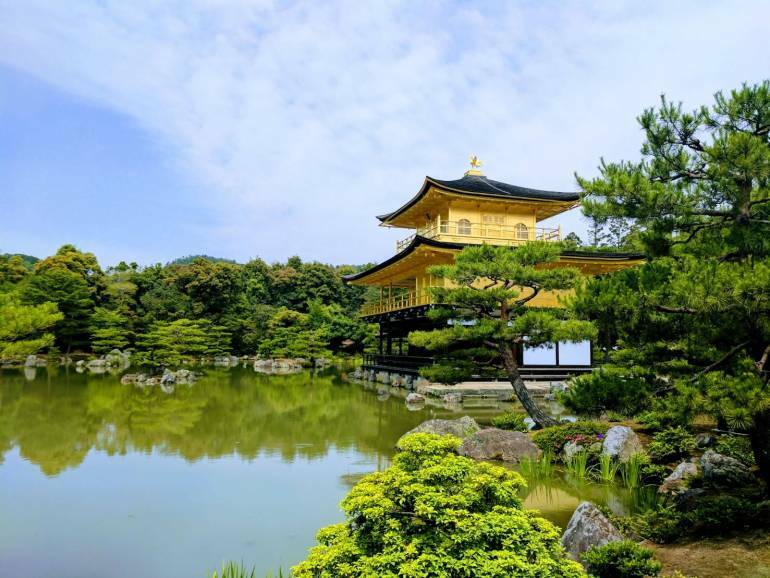 Day 1 is taking you through West Kyoto, starting at the famed Golden Pavilion and going through to Arashiyama’s bamboo groves, with plenty of spots in between. Starting at the pavilion works out best as it is less crowded, and your afternoon can be spent exploring Arashiyama without fear of closing times looming. For this day it helps to have the 500-yen city bus pass, which is very good value for money, especially if it’s summer or winter and you don’t want to be outside for too long. Since buses are a fixed rate in Kyoto, regardless of journey length, meaning you go far for your cash. It only takes three bus journeys and you’ve earned your ticket, so it’s definitely worthwhile! You can pick them up at the main bus terminal or from drivers, who will stamp them with the date for you. Now on to the fun! Although there is a start time here, the following are just estimates, as you can spend longer at sites you like, and less at others. You might as well start big and head to the most famous site in Kyoto, and possibly the whole of Japan. Hop on a bus from wherever you’re staying (look out for Raku buses #101 and #102 which connect major tourist spots) and head out to Kinkakuji. From the train station it takes about 45 minutes, so fingers crossed you get a seat and can settle in. The famous Zen temple has a long and tumultuous history, having been destroyed numerous times in battles and wars alike, and most recently set alight by an angry monk, before it was re-built in 1955. It is part of the Rinzai sect and the top two floors are covered in gold leaf, making it a truly beautiful sight as it sits above the surrounding lake and gardens. 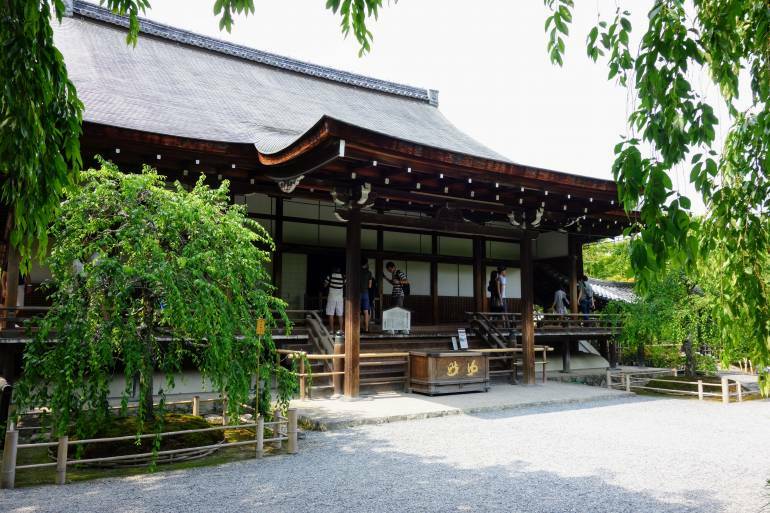 There is a small tea house on the grounds which serves matcha (green tea) and wagashi (traditional sweets) if you need a break as well as souvenir stalls towards the end. The buses are pretty regular and can be caught from just outside the temple entrance, by the vending machine corner. 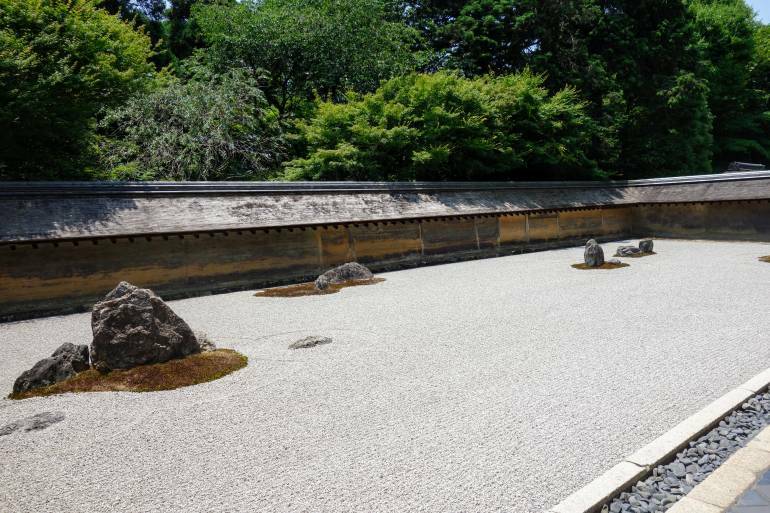 Use your bus pass and travel a few stops to Ryoanji. 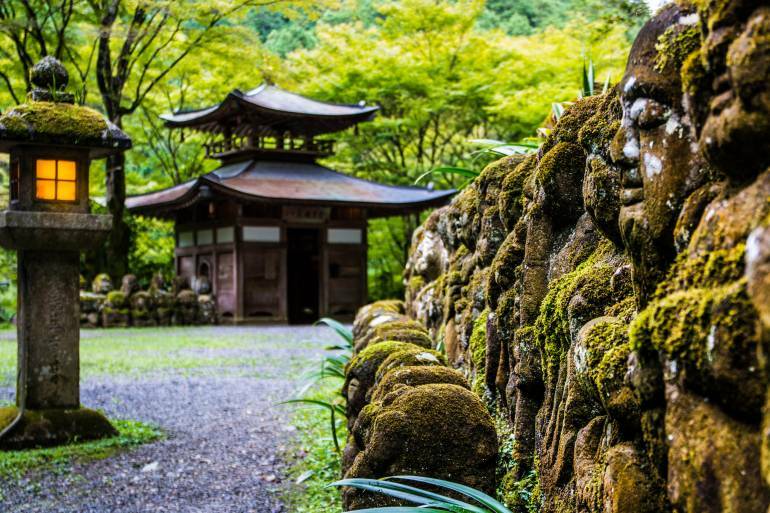 This is a stunning Zen temple with the most famous rock garden in Japan—with promises of enlightenment of you manage to see all 15 carefully positioned rocks from one view point. The rectangular garden has an unclear past, although the temple itself was originally a Heian aristocrat’s villa before becoming a Zen temple in 1405. There are numerous theories about the rock garden, but even if you don’t reach enlightenment, it’s very relaxing to look out over the garden from the Hojo steps and contemplate life. Ninnaji is a nearby World Heritage Site and head temple of the Shingon Sect of Buddhism, with a a stunning pagoda. Although the temple dates back to the 9th century, none of the current buildings are original due to the usual story of fire and war (but no monks this time). 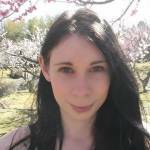 You can pay to enter the Goten (the head priest’s residence), which has beautiful rock gardens and buildings in the style of an imperial palace, or just stroll through the gardens to see the pagoda. If you hit Kyoto at the end of cherry blossom season, they have plenty of later-blooming ones here, so it’s a good spot to visit in late April. 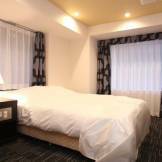 From Ninnaji, walk directly out of the fantastic entrance gate and down towards Omuro-ninnaji Station. This takes just a few minutes and is very easy to spot. 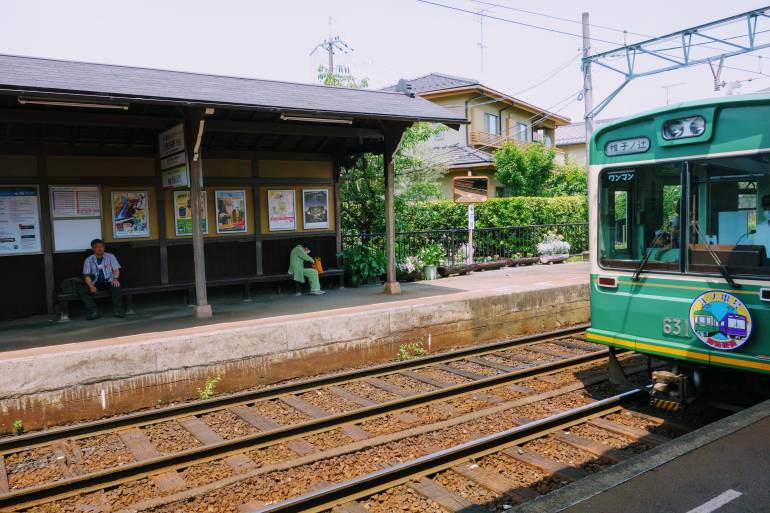 It’s a small local Randen station with just two platforms, so head to the far side and wait for the next tram to Katabirannotsuji (with signs for Arashiyama on the platform you can’t go wrong). You do a quick change at the final stop and hop on the connecting train to Arashiyama. (Note, on Hyperdia it is the Arashiyama Tramway option, on Google Maps it is just Arashiyama Station, with the Kimono Forest). If you arrive with weary feet, the station has a foot bath you can enjoy for ¥200, so this may be a good chance to rejuvenate those tired toes at the end of the central platform. There are also street food stalls and restaurants locally, so this is a great spot to take a break for lunch. Trains run every 10 minutes | Journey time: 22 minutes | Ticket price: 220 yen. Another World Heritage Site and the most important Buddhist temple in Arashiyama, Tenryuji is the head of its own school within the Rinzai sect. 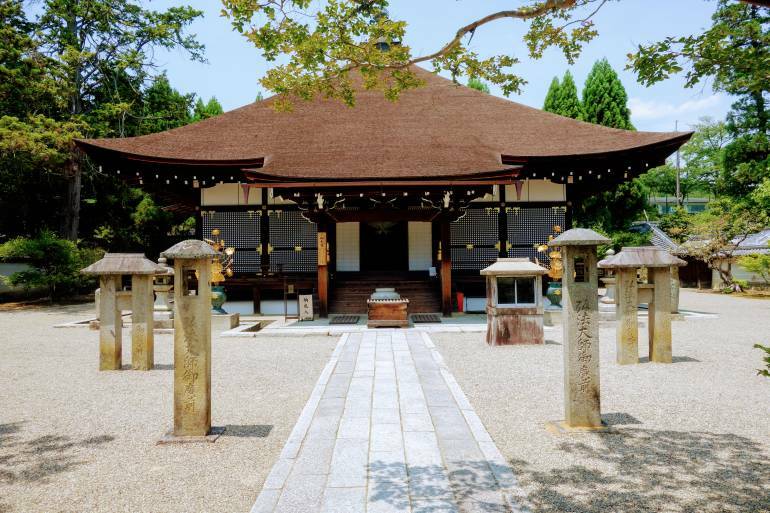 Built to appease the spirits of an emperor in 1339, the buildings have been re-built over time, with the current oldest dating back to the Meiji period. The garden, however, has survived and is a beautiful example of landscaping with a central pond and the stunning backdrop of the Arashiyama mountains. Note that there is an additional 300-yen charge to enter the buildings. 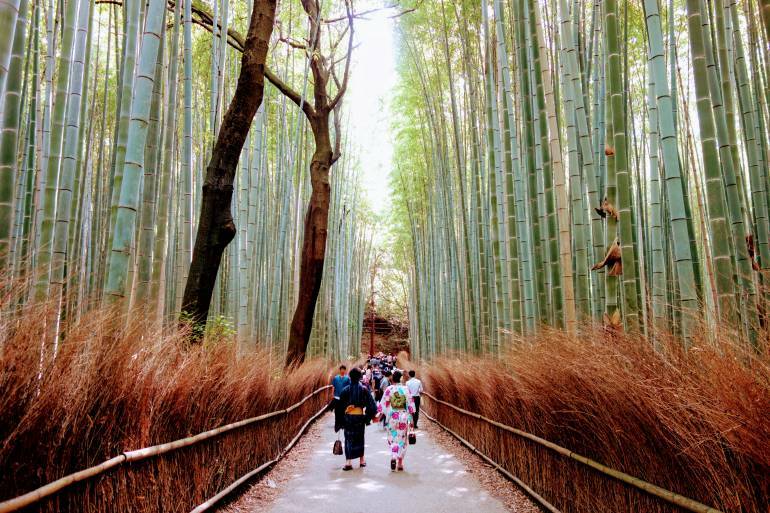 As you leave the temple you will find yourself in the world-famous Arashiyama Bamboo Forest, with hewn-out pathways and swaying trees creating a magical scene. As you stray further from the temple, the bamboo groves become thicker and taller, with a tranquil feeling descending, despite the (probable) crowds. 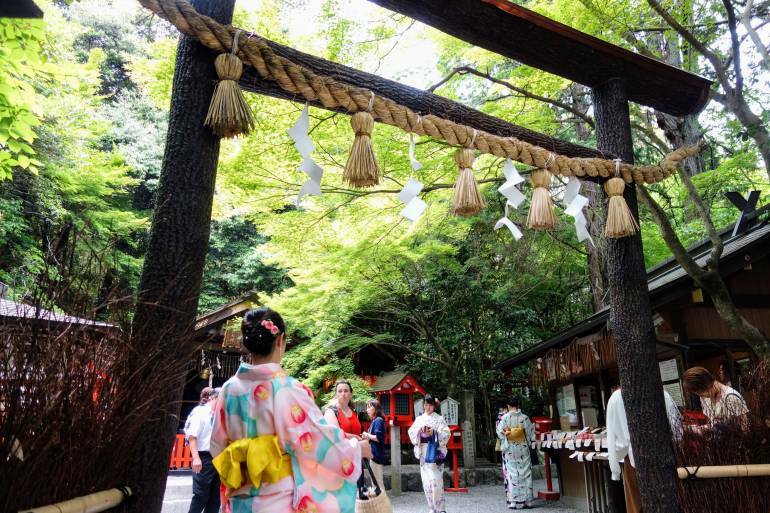 Nestled in the forest is the small Nonomiya Shrine, which was originally a sacred house for the Ise Shrine priestesses who were in training and is believed to help single women in their search for love. As these girls were often the unmarried daughters of emperors, the shrine is highly revered and an annual festival takes place celebrating its role in the important training. The shrine has a tortoise stone to grant your wishes within a year and beautiful heart-shaped ema (wooden plaques) for all your matrimonial and child-birth-related needs. If you have the time, Otagi Temple is an unusual spot, with 1200 uniquely carved rakan statues surrounding the grounds. While rebuilding the temple after numerous floods and disasters, head Priest Kocho Nishimura allowed visitors to carve their own statues under his guidance, as he was a keen scultpor. Thus, each is unique with different faces and poses, including some that give away their creation date (of between 1981 and 1991) you may spot a cassette player or tennis racket on your explorations. Head back down through the groves to the streets and town, where you can grab a refreshing drink to enjoy by the river, as well as some street food. There is plenty of seasonal ice cream here and the local speciality of yatsuhashi, the folded triangular sweet with a small filling inside—often red bean paste. There are boats along the river you can rent for an hour or so, which is a lovely way to explore the river, or you can relax at the water’s edge with an ice cream. 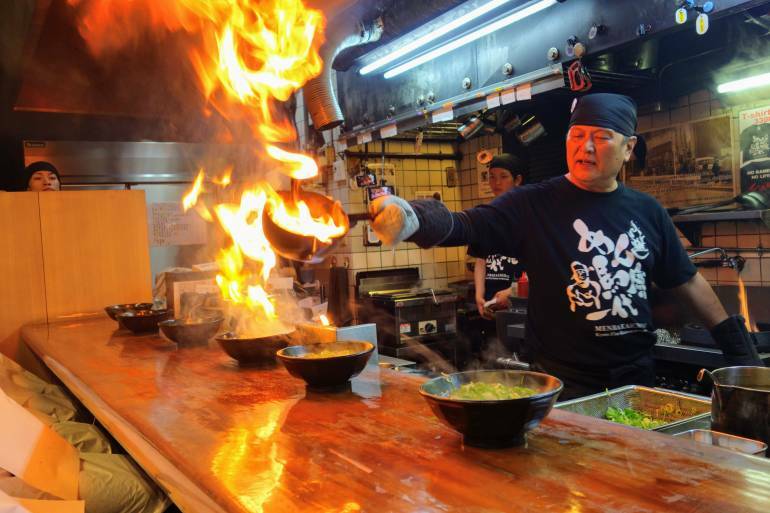 If you’re keen to try the infamous fire ramen of Kyoto, you can catch the number 93 bus and jump off when you reach Marutamachi Chiekoin bus stop, (probably easier to keep an eye on Google Maps as you travel and hop off when you’re near). The ramen relies on locally grown green onions, given a special flavor after being torched rather dramatically before you. After a fiery dinner, you can walk back down past the castle and towards the Kamo River. Once you reach it turn right just before you get to the bridge and enjoy the narrow streets filled with restaurants and bars. 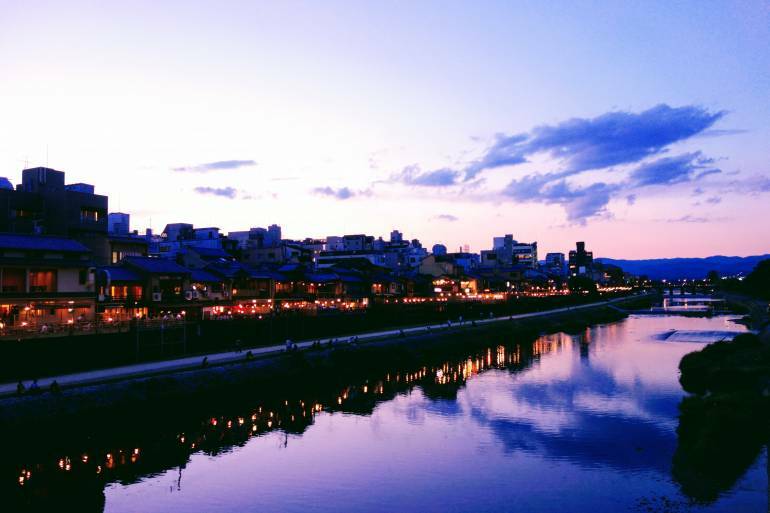 If you decided not to go for fire ramen, you can get a bus all the way back and alight around Kawaramachi so you can explore the Pontocho area and riverside area to your heart’s content. 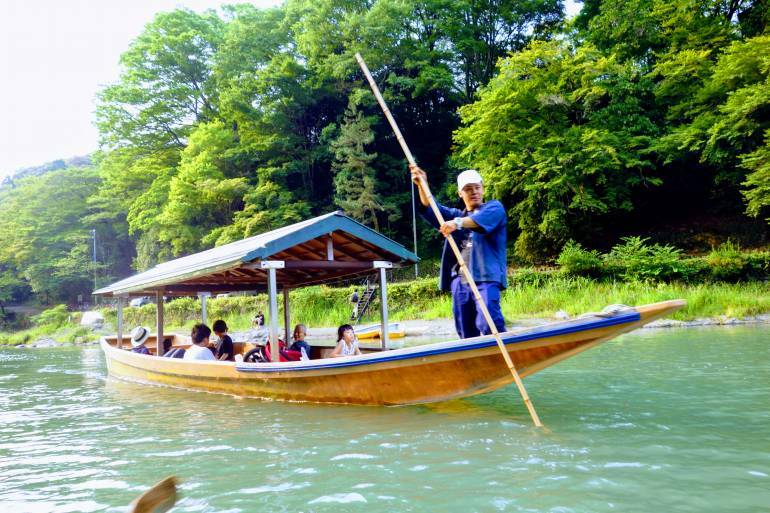 While Pontocho is expensive, the restaurants and bars running along the smaller river just beside the Kamo are far more reasonable and interesting. Across the river is the famous Gion area which is well worth exploring in the evening for all the traditional sight of Kyoto you’ve seen in guidebooks. 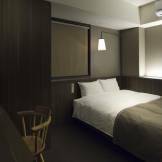 And for the cheapest and fastest ways to get from Tokyo to Kyoto, read our full guide here.